Once again, here are the 2015 Pac-12 standings. 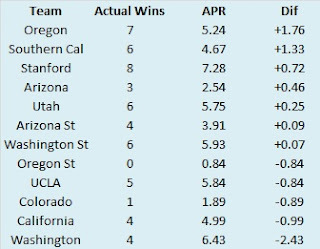 A pair of Pac-12 teams saw their APR numbers differ significantly from their actual records. Oregon finished 7-2 in the Pac-12 despite allowing 40 touchdowns in league play! Meanwhile Washington finished with a losing conference record despite scoring nine more touchdowns in Pac-12 action than their opponents. Close games played a small role in the disparity. Oregon went 3-1 in one-score games, while Washington was 1-2. However, neither was extremely lucky nor unlucky in close games. Turnovers don’t do anything to augment the story, as both had positive differentials in conference play. No, dominating wins and losses explain most of the disparity. While Oregon was still figuring things out early in the season, they lost by 42 points to Utah! That defeat tampers down their numbers. 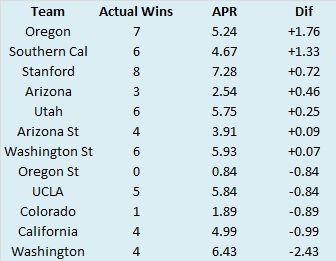 Couple that with the fact that the Ducks were unusually permissive on defense, and you can see why Oregon posted middling APR numbers. On the other hand, while Washington won just four of nine conference games, they were absurdly dominant in three of those wins. The Huskies defeated Arizona, Oregon State, and Washington State by a combined 126 points with no win coming by less than five touchdowns! One of the more interesting developments that has coincided with the Pac-12’s expansion has been the absolute disappearance of Colorado’s homefield advantage since joining the league. The table below lists Colorado’s home and road splits in conference play from their final six seasons in the Big 12 with the same splits over their first five seasons in the Pac-12. While they were mediocre at home during their last few seasons in the Big 12, their home record was far superior to the duds they consistently laid on the road. However, since joining the Pac-12, their home and road records are effectively the same. Now, some might point out that Colorado’s move to the Pac-12 has corresponded with a cratering of the football program. And to that point, I would 100% agree. In the interest of analyzing this further, I decided to look at a metric that takes into account how well a team is ‘supposed’ to perform and judges them based on expectations, not raw results. I am talking of course, about the Las Vegas line or point spread. For the uninitiated (and churchgoing) audience, the point spread is an unbiased look at who should win a certain game, and more importantly, by how much. Using the points spread, I calculated the Spread Adjusted Margin (SAM) for each Colorado conference game from 2005-2015 and determined the per game averages for their home and away contests. The SAM is pretty easy to calculate. Here are two examples. Say Colorado is expected to beat a team by 3 points. They win by 7. Their SAM for this game is +4. This is, the margin they were supposed to win by (3) subtracted from how much they actually won by (7). Now say Colorado is expected to win by 10 points. Instead they lose by 2 points. Their SAM for this game is -12. That is, the margin they were expected to win by (10) subtracted from how much they actually won by (-2). Easy right? Here are the results separated by their conference affiliation. 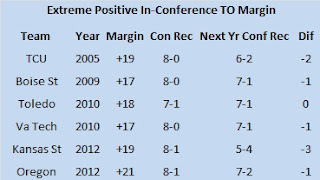 As you can see, there does appear to have been a real change since the Buffaloes joined the Pac-12. In their final six Big 12 seasons, the Buffaloes produced a SAM that was almost five points per game better at home. However, in Pac-12 play, the Buffaloes have about the same SAM at home and on the road. I have my own theories (cough cough Marijuana) as to why this might have occurred, but I’d be interested to hear if any readers have (preferably crackpot) theories on why this might be. Seven conferences down, three to go. This week we go over the Pac-12. Here are the 2015 Pac-12 standings. So we know what each team achieved, but how did they perform? 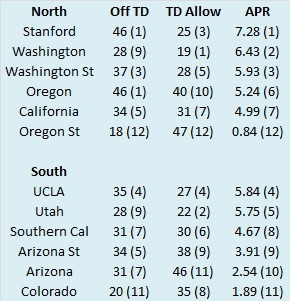 To answer that, here are the Yards Per Play (YPP), Yards Per Play Allowed (YPA) and Net Yards Per Play (Net) numbers for each Pac-12 team. This includes conference play only, with the championship game not included. The teams are sorted by division by Net YPP with conference rank in parentheses. College football teams play either eight or nine conference games. Consequently, their record in such a small sample may not be indicative of their quality of play. A few fortuitous bounces here or there can be the difference between another ho-hum campaign or a special season. Randomness and other factors outside of our perception play a role in determining the standings. It would be fantastic if college football teams played 100 or even 1000 games. Then we could have a better idea about which teams were really the best. Alas, players would miss too much class time, their bodies would be battered beyond recognition, and I would never leave the couch. As it is, we have to make do with the handful of games teams do play. In those games, we can learn a lot from a team’s Yards per Play (YPP). Since 2005, I have collected YPP data for every conference. I use conference games only because teams play such divergent non-conference schedules and the teams within a conference tend to be of similar quality. By running a regression analysis between a team’s Net YPP (the difference between their Yards per Play and Yards per Play Allowed) and their conference winning percentage, we can see if Net YPP is a decent predictor of a team’s record. Spoiler alert. It is. For the statistically inclined, the correlation coefficient between a team’s Net YPP in conference play and their conference record is around .66. Since Net YPP is a solid predictor of a team’s conference record, we can use it to identify which teams had a significant disparity between their conference record as predicted by Net YPP and their actual conference record. I used a difference of .200 between predicted and actual winning percentage as the threshold for ‘significant’. Why .200? It is a little arbitrary, but .200 corresponds to a difference of 1.6 games over an eight game conference schedule and 1.8 games over a nine game one. Over or underperforming by more than a game and a half in a small sample seems significant to me. In the 2015 season, which teams in the Pac-12 met this threshold? 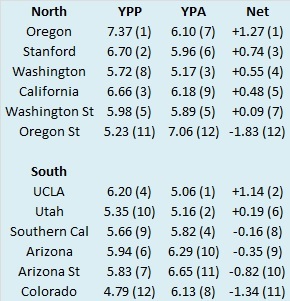 Here are the Pac-12 teams sorted by performance over what would be expected from their Net YPP numbers. 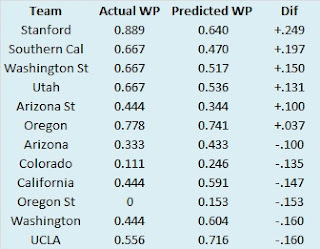 Stanford was the sole Pac-12 team to significantly over or under shoot their expected record based on YPP. How did the Cardinal manage to do this? Well, it is a bit of a mystery. The Cardinal won eight conference games, with seven coming by at least ten points, which indicates they were pretty dominant. Their lone conference loss came by just two points and they actually had a negative in-conference turnover margin. So why don’t their YPP numbers indicate a dominant team? I think the answer lies in the one game they lost. While the Cardinal fell to Oregon by just two points on a failed two point conversion, the YPP numbers in the game were much starker. Oregon averaged over nine yards per play and outgained the Cardinal by three yards per play on average. Remove that game and Stanford’s YPP numbers are +1.15 instead of their solid, but hardly elite +0.74. Speaking of Oregon and Stanford, even casual college football observers know they have dominated the Pac-12 North since the conference split into a pair of divisions beginning in 2011. Either the Ducks or Cardinal have won the North each season and gone onto defeat the South champion. The South on the other hand, has never had a repeat champion (UCLA appeared in the title game for two consecutive years thanks to postseason ineligibility at the other Los Angeles school) and four of the division’s six schools have represented the South in the title game in five seasons of divisional play. A half-decade into the new incarnation of the Pac-12, I wanted to take a look back and see which school has been the best in the South. Pac-12 teams play nine conference games, which includes four games against teams from the North. As those games can vary from very difficult (Oregon and Stanford) to piece of cake (Oregon State in 2015), I decided to look at only intra-divisional games. In other words, I only looked at contests involving Pac-12 South teams. The year by year and overall results are listed below. 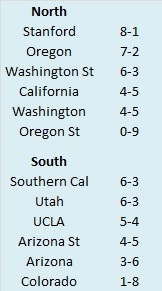 There has been a great deal of parity at the top of the Pac-12 South. Arizona State, Southern Cal, and UCLA are separated by just a single game with the Bruins ranking as the best of the Pac-12 South five years in. Arizona has been middling, while conference newbies Colorado and Utah have struggled, especially the Buffaloes. After beating Utah to end the 2011 regular season, Colorado is in the midst of a 20-game losing streak to divisional foes. Yikes! Somewhere Gary Barnett is smiling. Or more likely, looking the other way while sexual assaults happen. 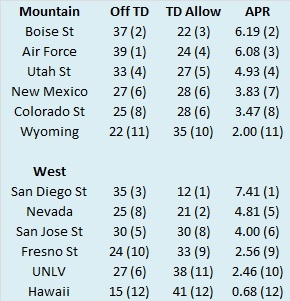 Last week, we looked at how Mountain West teams fared in terms of yards per play. This week, we turn our attention to how the season played out in terms of the Adjusted Pythagorean Record, or APR. For an in-depth look at APR, click here. If you didn’t feel like clicking, here is the Reader’s Digest version. APR looks at how well a team scores and prevents touchdowns. Non-offensive touchdowns, field goals, extra points, and safeties are excluded. The ratio of offensive touchdowns to touchdowns allowed is converted into a winning percentage. Pretty simple actually. Once again, here are the 2015 Mountain West standings. 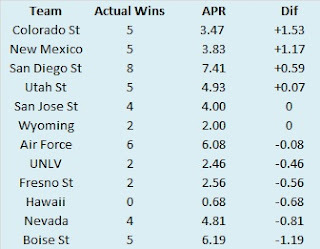 Finally, Mountain West teams are sorted by the difference between their actual number of wins and their expected number of wins according to APR. 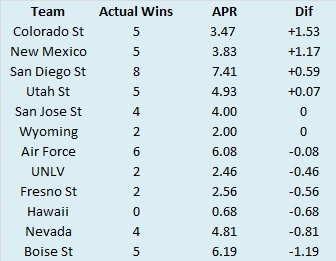 Colorado State was the only Mountain West team to significantly outperform their APR numbers. The Rams actually allowed more touchdowns than they scored, but managed to win five of eight league games (their bowl game with conference rival Nevada is excluded from this analysis). The Rams won both of their one score league games and were outscored by significant margins in each of their league losses. Boise State, San Diego State, and Utah State beat the Rams by a combined 70 points. Since APR didn’t give us a whole lot to discuss, let’s talk about something else, namely the Mountain West’s standing among mid-major (Group of Five) leagues. With the advent of the College Football Playoff, the current structure of haves (Power Five) and have nots (Group of Five) has been in place for just two seasons. 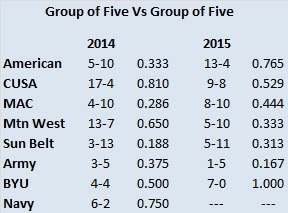 The table below lists how each Group of Five conference, as well as the Group of Five independents (and BYU is considered Group of Five here) have fared against each other (regular season games only) in 2014 and 2015. After faring well against their fellow mid-majors in 2014, the conference took a step back in 2015, winning just a third of their games against other Group of Five members. This could well be a one-year blip, so let’s look at things another way. This next table lists every current Mountain West team alphabetically and indicates the last season they finished ranked in the AP Poll and the last season during which they appeared in the AP Poll at any point. 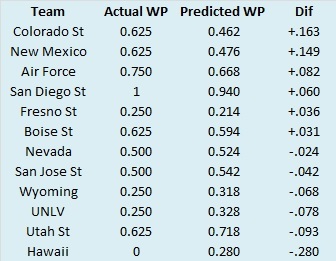 Outside of Boise State, the results for the other Mountain West teams are not too great. 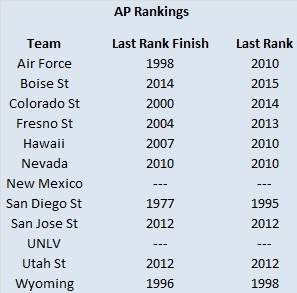 San Jose State and Utah State each registered historic seasons in 2012, and while they have been contending for bowl games in the three seasons since, those were clearly outlier years. Similarly, Nevada rode Colin Kaepernick to a top-10 finish in 2010, but has not sniffed the polls since. While Fresno State flirted with a BCS bowl bid in 2013, they have not finished a season ranked in over ten years. I could go on. If the Mountain West wants to assert itself as the best mid-major conference it needs a team to join Boise State in the national conscience. San Diego State ran roughshod over the Mountain West in 2015, but the Aztecs stumbled in the non-conference, losing to California and Penn State as well to South Alabama of the Sun Belt. 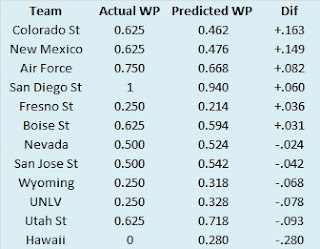 Group of Five teams are at a disadvantage when they go up against Power Five schools, but Mountain West teams can improve their national profile by winning more games in the non-conference against teams of similar regard. Only four more conferences to go in our 2015 recap. This week we go over the Mountain West. 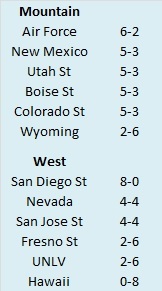 Here are the 2015 Mountain West standings. So we know what each team achieved, but how did they perform? To answer that, here are the Yards Per Play (YPP), Yards Per Play Allowed (YPA) and Net Yards Per Play (Net) numbers for each Mountain West team. This includes conference play only, with the championship game not included. The teams are sorted by division by Net YPP with conference rank in parentheses. College football teams play either eight or nine conference games. Consequently, their record in such a small sample may not be indicative of their quality of play. A few fortuitous bounces here or there can be the difference between another ho-hum campaign or a special season. Randomness and other factors outside of our perception play a role in determining the standings. It would be fantastic if college football teams played 100 or even 1000 games. Then we could have a better idea about which teams were really the best. Alas, players would miss too much class time, their bodies would be battered beyond recognition, and I would never leave the couch. As it is, we have to make do with the handful of games teams do play. In those games, we can learn a lot from a team’s Yards per Play (YPP). Since 2005, I have collected YPP data for every conference. I use conference games only because teams play such divergent non-conference schedules and the teams within a conference tend to be of similar quality. By running a regression analysis between a team’s Net YPP (the difference between their Yards per Play and Yards per Play Allowed) and their conference winning percentage, we can see if Net YPP is a decent predictor of a team’s record. Spoiler alert. It is. For the statistically inclined, the correlation coefficient between a team’s Net YPP in conference play and their conference record is around .66. Since Net YPP is a solid predictor of a team’s conference record, we can use it to identify which teams had a significant disparity between their conference record as predicted by Net YPP and their actual conference record. I used a difference of .200 between predicted and actual winning percentage as the threshold for ‘significant’. Why .200? It is a little arbitrary, but .200 corresponds to a difference of 1.6 games over an eight game conference schedule and 1.8 games over a nine game one. Over or underperforming by more than a game and a half in a small sample seems significant to me. In the 2015 season, which teams in the Mountain West met this threshold? 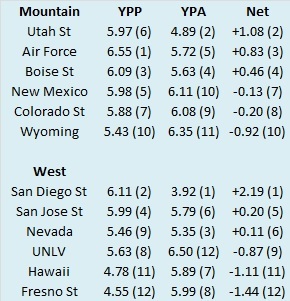 Here are the Mountain West teams sorted by performance over what would be expected from their Net YPP numbers. Only one team saw their actual record differ significantly from their expected record based on their YPP differentials. And boy did it ever differ. For the second time in three seasons, Hawaii finished winless in Mountain West play. The 2013 team also posted decent YPP numbers and improved to three league wins in 2014, so there is hope for new coach Nick Rolovich. So how did Hawaii go about losing all their conference games despite bad, but not horrendous YPP numbers? Close games are not the culprit, as Hawaii only lost a single one-score league game (by a single point at New Mexico). No, turnovers told the story for the Warriors. Hawaii turned the ball over 26 times in their eight conference games, while only forcing six of their own. Their in-conference turnover margin of -20 was by far the worst in the conference (13 worse than second to last Wyoming). We’ll discuss more about this historic margin later. I am not making the argument that Hawaii was a ‘good’ team in 2015. They were shut out in each of their first three road games (albeit against strong competition in Ohio State, Wisconsin, and Boise State). However, they did show signs of life early in the year by beating Colorado of the Pac-12 thanks to a little assist from some bumbling officials. If their turnover margin was merely bad and not historically poor, the Warriors probably would have scrounged up at least one and potentially a pair of conference wins. Hawaii was not the only Mountain West team with a historical in-conference turnover margin in 2015. While Hawaii was struggling with a -20 margin, San Diego State was rolling through the conference en route to an undefeated record and league title with a +19 turnover margin (excluding their championship game win over Air Force). 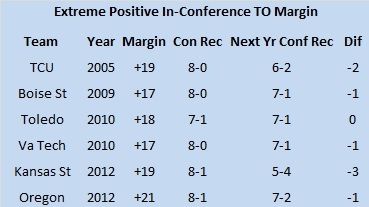 To get a handle on what one might expect from these two polar opposites going forward, I decided to look at teams with similar extreme in-conference turnover margins and see how they performed the following year. Here we’ll define extreme as averaging two more or two less turnovers per game that your opponent. For an eight game conference schedule, that would equate to a turnover margin of +16 or -16. Similarly, for a nine game schedule that would be either +18 or -18. Hawaii and San Diego State were certainly unique in 2015. Only ten other teams since 2005 posted such an extreme turnover margin (Arkansas State also fit the criteria, but like the Warriors and Aztecs, their follow up performance is unknown at this time). We’ll start with the teams with extreme negative turnover margins. Obviously, teams with extremely poor turnover margins don’t tend to win a lot of games. These four squads combined to go 2-28 in conference play. Perhaps not surprisingly, three of the teams had new head coaches the following year. Oklahoma State elected to retain their head coach (probably since he was in his first season), and that has worked out pretty well for the Cowboys. New Mexico State is a bit of an oddity, as they became a college football independent after their turnover plagued final season in the WAC. That is why there is no follow up conference record listed for them. As for the other three teams, well, they all improved their conference record by at least two games with Oklahoma State and Wyoming qualifying for bowls. For what it’s worth, New Mexico State’s overall record improved from 1-11 to 2-10, so each member of the quartet improved the next season. A pessimist might point out each team had nowhere to go but up after their poor showings and a statistician might highlight the small sample size here. However, another statistician might bring up something about regression (or in this case progression) to the mean and opine that an extremely poor turnover performance is unlikely to be repeated. As for me, I would set the over/under on league wins at two for Hawaii in 2016. Now let’s look at the other side of the coin. Here are teams with extreme positive turnover margins. In a not too surprising development, teams with historically great turnover margins tend to have good records. These six teams combined to go 47-3 with Oregon and Toledo being the only teams to not win a conference title. Unlike the poor turnover teams there was continuity at the head coaching position the following season with only Oregon losing their head coach (to the NFL no less). For the most part, each team remained strong the next year with only Kansas State falling out of contention for a conference title. Each team qualified for a bowl game in the following season and two thirds of the teams declined by one game or less. An optimist would likely say these teams had nowhere to go but down after compiling their pristine conference records, and once again, a point can be made about small sample sizes. However, as with Hawaii, San Diego State is unlikely to see their extreme turnover margin repeated. The Aztecs did not throw a single interception in conference play last year! While I expect them to be contenders in the conference in 2016, expecting another undefeated, scorched earth run through the Mountain West is likely folly.